Neulich hatte ich eine Email von Stephen Visakay im Fach mit den folgenden Bildern. Ein sehr interessanter Artikel über Swizzle Sticks und Barware, den ich euch nicht vorenthalten möchte. Ich habe den Text für euch abgeschrieben, mir aber das übersetzen gespart. Beim zweiten Bild fehlen ein paar Worte, da ich sie in den Spiegelungen nicht ganz erkennen kann. Vintage finds, what they´re worth, and a nativity set valued at $ 900! 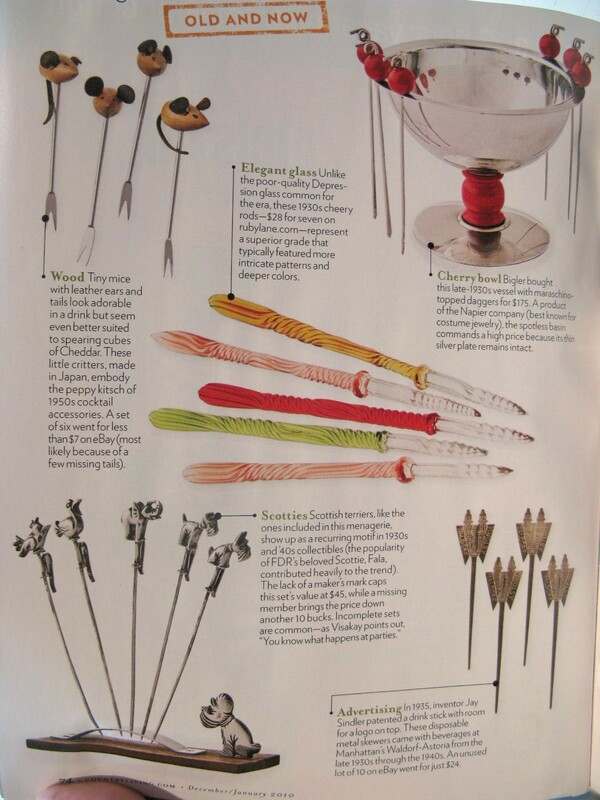 Olive spears, swizzle sticks, drink stirrers- no matter what you call them, these bar accessories recall a glamorous era when cocktails were king. 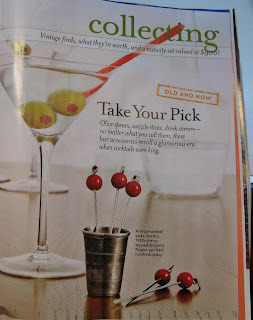 Antique cocktail picks, like this 1930s cherry topped design by Napier, can fetch hundreds today. Ironically enough, Prohibition helped kick off America´s cocktail craze. Adding juice and fruit slices to drinks became customary ways to disguise the unpleasant taste of bootleg liquor, and the invention of the cocktail pick provided a means of harpooning all those delicious garnishes without dipping one´s fingers into the glass. 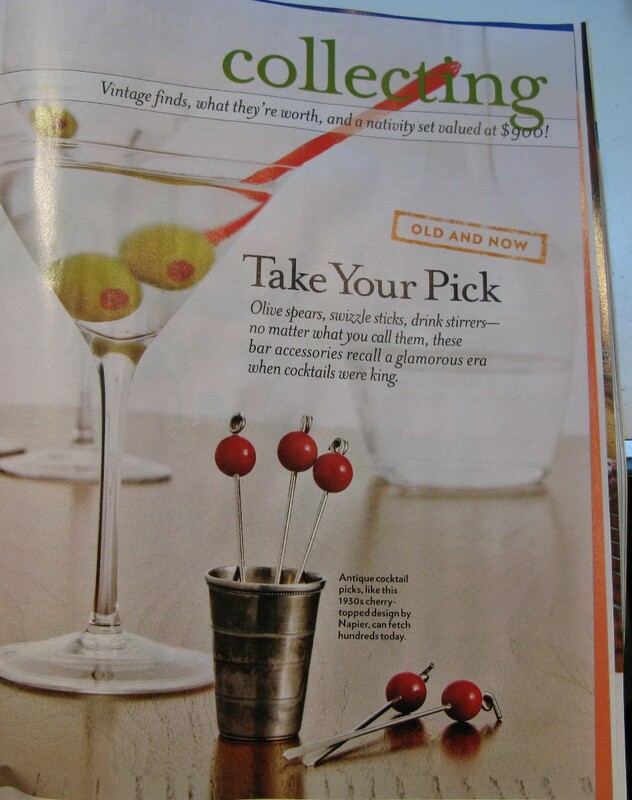 Plus says Stephen Visakay, author of Vintage Bar Ware, “If you want to make something popular, pass a law against it.” By the 1950s, most suburban homes featured a bar, with the 5 o´clock martini hour as a daily staple. Though Americans tend to down more smoothies than scotch these days, collectors still seek covetable sets of picks from the 1920s to the ´60s. Sites like eBay and cocktailshakers.com offer a wide range of price points: from less than 10 bucks for a later, incomplete set to around $400 for mint condition Bakelite figurals. Cheers to that. French According to Visakay, the best 1920´s deco designs come from France, and this chrome-plated snail proves no exeption. 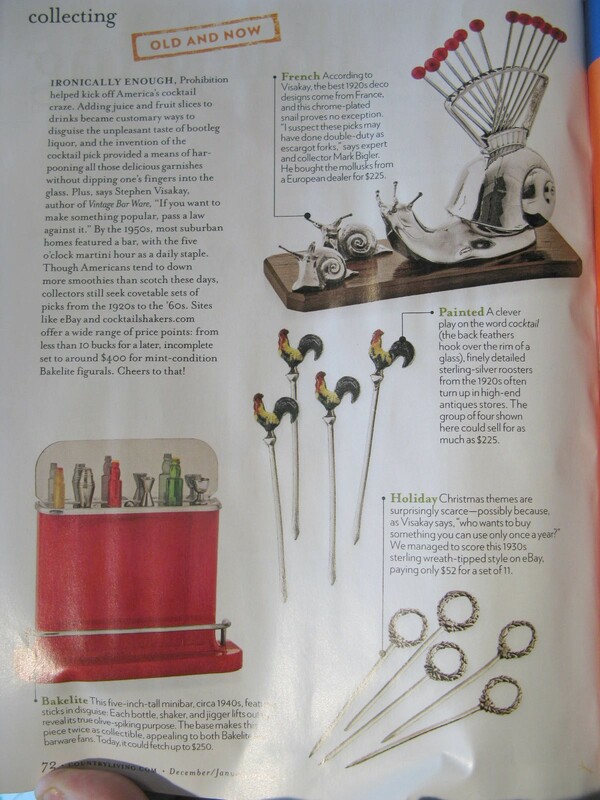 “I suspect these picks may have done double-duty as escargot forks” says expert and collector Mark Bigler. He bought the molluscs from a European dealer for $225. 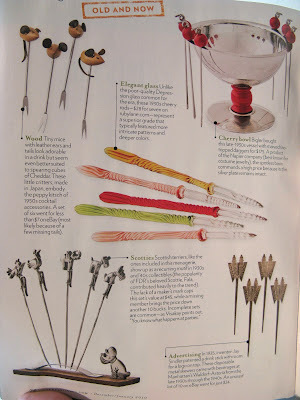 Painted A clever play on the word cocktail (the back feathers hook over the rim of a glass), finely detailed sterling silver roosters from the 1920s often turn up in high-end antiques stores . The group of four shown here could sell for as much as $225. Holiday Christmas themes are surprisingly scare-possibly because, as Visakay says, “who wants to buy something you can use only once a year?” We managed to score this 1930s sterling wreath-tipped style on eBay, paying only $52 for a set of 11. Bakelite This five-inch-tall minibar, circa 1940 featuring sticks in disguise: Each bottle, shaker and jigger lifts out … reveals its true olive spiking purpose, The base makes this… piece twice as collectible, appealing to both Bakelite… barware fans . Today it could fetch up to $250. Wood Tiny mice with leather ears and tails look adorable in a drink but seem even better suited to spearing cubes of Cheddar. These little critters, made in Japan, embody the peppy kitsch of 1950s cocktail accessories. A set of six went for less than $7 on eBay (most likely because of a few missing tails). Elegant glass Unlike the poor-quality Depression glass common for the era, these 1930s cherry rods-$28 for seven on rubylane.com- represent a superior grade that typically featured more intrigate patterns and deeper colors. Cherry bowl Bigler bought this late-130s vessel with maraschino-topped daggers for $175. A product of the Napier company (best known for costume jewelry), the spotless pasin commands a high price because its thin silver plate remains intact. Scotties Scottish terriers, like the ones included in this menagerie, show up as a recurring motiv in 1930s an ´40s collectibles (the popularity of FDR´s beloved Scottie, Fala, contributed heavily to the trend).